Here's another look back at the genesis of my regular column at the Pulse, For Your Consideration. My first time attending SPX was a revelation. I'd walked through Artist's Alley at the larger conventions, but the quality and diversity at those shows didn't even compare to what I saw in Bethesda. One of the artists with whom I had the pleasure of speaking was G.B. Tran. He has published his own Xeric-awarded comic, Content, as well as having contributed to Negative Burn and Postcards: True Stories That Never Happened. What follows is the spotlight and interview I did for the site, Independent Propaganda. Enjoy. GB Tran was one of the more interesting people I met at this past year’s SPX. The hand-lettered Xeric Award sign at his table caught my eye, and his enthusiasm – about comics, about how the show was going – kept me there. 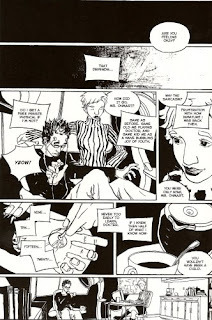 Tran has self-published two issues of his comic, CONTENT, and his excitement about the latest issue was evident, recommending it over his initial foray, which was awarded a Xeric Grant in 2002. I asked him about the book and unlike a lot of creators at the Expo with traditional “floppy” comics for sale, CONTENT is not a continuing narrative, but a haven for the stories GB Tran wants to tell. Issue #1, “Losing Everything You Never Had” is about Elin Ohmart, a man in his early twenties who volunteers for a scientific test being conducted by Dr. Stefania Carani. Carani is researching the brain, hoping to develop some understanding of the 85% of our gray matter that apparently lays dormant. After hooking Elin up to the monitor, the young researcher induces him into a deep state of REM sleep and then stimulates isolated areas of his brain with electromagnetic pulses hoping to heighten activity in those idle sections. For his part, Elin is happy to oblige Dr. Carani as he finds her very attractive. And then Elin is back in Dr. Carani’s chair attempting to reconcile the fact that he was under for six hours though it feels as if he only just fell asleep. Elin made little sense at first, but once Dr. Carani was able to question him she realized this was a “breakthrough in exploring the human subconscious.” The test confirmed her suspicions and she was excited to continue her testing on other subjects. By the time the debriefing was over, Elin just wanted to go home and sleep. Driving away from the clinic he finds himself stopped at a school while a crossing guard shuttles a group of young kids across the street. While sitting in his car, Elin ruminates on the wonders of youth and thinks back to his own childhood. His thoughts wander to Tatum, the bully that picked on him constantly, and about how one day at recess a dad told him to stand up to Tatum. From then on Elin and Tatum were best friends. And then it clicks (“But why was that dad naked?”). He, as the dreaming Elin, was the dad that told the young Elin to stand up to Tatum. Ohmart was remembering something that he had initiated just hours ago, and yet it also happened years ago to the boy he once was. This understanding leads to an obsession for Elin. Despite protests from Dr. Carani he wants to return and speak again to the boy he was. His persistence pays off as the doctor eventually acquiesces. But one time back is not enough. Like most of us, Elin is unhappy with the childhood he remembers and pines away for the hurt, lost boy lingering in his past. He believes he can change history and erase all the pain that still haunts him. Even as he finds happiness in the present, Elin continues to pursue this flawed dream. Putting himself at risk, both mentally and physically, he unfairly asks Stefania – who has discovered an affection for him through all this – to join him on this quixotic pursuit. But ultimately Elin gets what we all get, an unchanging history and a blank slate upon which to write the future; but only if he can cast off the ghosts that still linger. Tran whisks us through a challenging and inventive tale, shedding a light upon the insecurities and anguish we all carry with us. Who doesn’t wish their childhood might have been better? Why do children have to suffer so much – a nasty divorce, being taunted by the other children? All these little pains we endure, we endure fiercely and intimately. But time moves on, and the haze of memory dulls most of the heartache. Like Elin, we are left with the past we have, and nothing can be done about that, unless we want to jeopardize our future. And in the end, which is more important? Elin knows. CONTENT #2, “Kaleidoscope,” was published last summer, four years after Tran’s initial book. This one is bigger in size (11 by 7 ½ compared to the first issue’s dimensions of 9 ½ by 6 ½) as well as scope. With this second issue, one can see GB stretching not only his artistic muscles, but his storytelling muscles as well. “Kaleidoscope” is a book that needs to be read more than once in order to get everything that happens. Certainly, a first read will not leave you confused, but subsequent readings will reveal so much more, giving readers a deeper understanding of the story Tran is sharing with us. “Kaleidoscope” is a tale of how our lives are interconnected even when separated by thousands of miles and without ever having met. Tran layers this issue with a number of smaller tales, which weave in and over and around one another to tell one dense, complex story. Spanning from Phoenix, Arizona to South Vietnam to southern France and back to Brooklyn, this tale takes place on three different continents and yet its themes and situations are as close as your back yard. Once again, Tran grounds his characters, making them believable while giving his audience people to whom they can relate. Although stories of this sort often come off as being too “cute” – everything tying up neatly into a pristine package with the final turn of the page – this is not the case with “Kaleidoscope.” Tran deftly intertwines each of the stories around one another, utilizing the “less is more” adage, leaving his scenes quick and sharp, not allowing readers to relax for a minute. This approach keeps his audience interested and doesn’t give them time to think about the whole story, delaying their discovery of just how fully these disparate lives all tie together until the end. I understood Tran’s excitement about this issue once I finished reading it. It’s a very compelling story told in a complex manner, one that might deter most writers. Tran does not speak down to his audience and asks that they work to understand the story, dropping them into the middle of a scene without any clumsy exposition – leaving readers to wonder about whom everyone is and what their history might be. He allows the story, and the revelation of the characters, to unfold naturally. And once the various pieces are finally put together, all is made clear like some elaborate, well-drawn puzzle. Tran’s art also takes a giant leap forward with this second issue of CONTENT. One can see GB experimenting on almost every page. He utilizes the symbology of comics masterfully in the beginning, forming images that cannot be taken literally (a “bumper to bumper” traffic jam of airplanes and helicopters leading from Vietnam to the golden arches and skyscrapers of America) but which convey so much more to the understanding of the story. 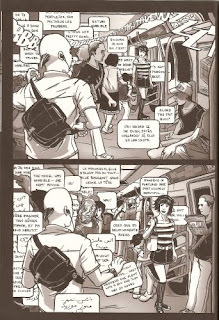 In a scene on the subway, Tran draws one of my favorite comic panels of recent memory. A young man spies a pretty woman on the train and finds himself having to shove his way through the word balloons that clutter the car only to find himself too late to speak with her thanks to the claustrophobic conversations surrounding him. Tran’s linework is also much tighter with this book, his brushstrokes smoother and more confident than in the first issue. 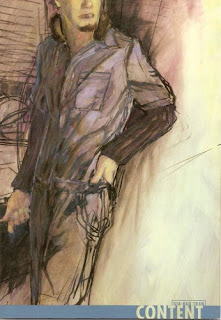 GB Tran is an accomplished artist whose work is deserving of a wider audience. If you like comics, and you want to be challenged, then do yourself a favor and pick up CONTENT #1 and #2. GB TRAN: It’s a very satisfying way to express and convey ideas that require a lot of audience interaction... y’know, reading in between the panels and stuff. And, well, I’m not a phenomenal writer nor a mind-boggling illustrator but with comics I can try to be just enough of both to tell an interesting story. INDYPROP: I really enjoyed the philosophical questions brought up in issue 1 of CONTENT. I was wondering if you could talk a bit about the genesis of that story. GB: It came from a dream. I rarely remember my dreams in the morning and the ones I do tend to be mundane and bland so this one really stuck out. Soon enough, it started to evolve into sequential panels and voila, a Xeric submission was born. INDYPROP: In Kaleidoscope, I could really see you experimenting not only with your storytelling, but also your artwork. Was this a conscious attempt on your part with this issue, and what did you learn from stretching your artistic muscles in this way? GB: Absolutely... it was great to play with the artwork as much as the shifting narrative structure. It’s very gratifying to explore various approaches and satisfying to not have the story unfold in a singular way. INDYPROP: Most people making comics - or creating in most any artistic medium - have a day job. I was curious what your "day job" might be and how it contributes, if at all, to your work in CONTENT? GB: I’m an anonymous commercial illustrator freelancing mainly in apparel graphics. As day-jobs go, it’s flexible and provides opportunities to try different aesthetics without getting too attached or precious about the results. It pays the bills so I feel fortunate, except when I have to draw a koala wearing oversized rainbow sunglasses or something. GB: I’ve started my next book and am escaping from the Northeast winter to Vietnam in January to do further research for it. Still in its early stages so I’m very excited to see how the project develops. I also just finished a story with writer Chris Stevens for Jason Rodriguez’s POSTCARD anthology due out next summer, and am collaborating with writer Hanvey Hsiung on some stories that—by virtue of currently being sans publisher—will be trickling out whenever funds allow. We’re aiming to debut the first installment at the New York Comic-con in February.